Just started reading up on the new Doorbell and Security bits Nest has been releasing. A quick skim through the board didn't bring up any mention of them (that I caught). Any chance of adding support for those down the road? The camera portion works just like the other cameras. The plugin immediately found it after my install. Obviously none of the other stuff that Nest Aware adds. I also was able to add it into Blue Iris which was nice. I plan to support whatever is added to the Nest API, but so far nothing has been added for these new devices. I posted a message on nest developers message board asking about an API. 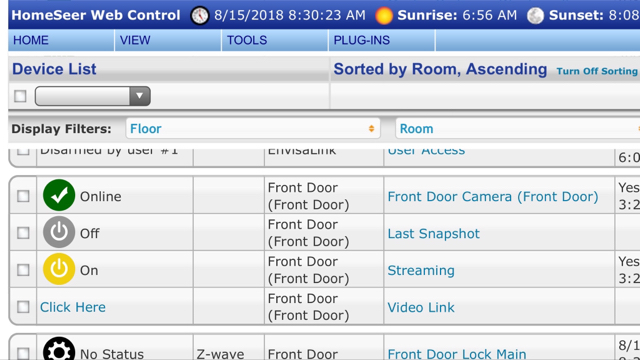 I'd LOVE it if I could use your plugin to see all my nest window, door and motion sensors and the nest guard and nest Yale Lock. I would also like to add Nest Doorbell/Hello as well as the Yale Lock that interfaces with nest. When do you think you will add this functionality? Check two messages up. Nothings been added to the API yet for him to add any additional functionality. I'm also looking forward to it as well though. Put me down as well for support of the Nest Yale Lock. I also have the Hellow Door Bell. Any update of API and this Plugin supports the Nest Yale Lock yet? I just installed the Nest Hello and your Nest plugin for HomeSeer. The plugin authorized without any issues but the only installed device is the Home/Away device. It is my understanding that the camera in the Nest Hellow should be discovered automatically. I have restarted HomeSeer and there are no errors in the log. How do I add the camera on my Nest Hello? That’s Strange. It found my Nest Hello for some reason. Lol. I just installed a Nest Hello and the devices where discovered by HS. Any idea how to get it to show up as a camera in the main settings? Edit: I found a post on Reddit that shows you how to get the streaming URL if you publicly share your camera. It works. Search there for details. Do you have the link for this information? I'm trying to set my Nest Hello up with homeseer.